HTA Programme funding is governed by the need for evidence and scientific quality, reflecting funding of the National Institute for Health Research (NIHR) by the NHS. The need criterion incorporates covering the spectrum of diseases, but also taking account of research supported by other funders. This study compared the NIHR HTA Programme portfolio of research with the UK burden of disease as measured by Disability-adjusted Life Years (DALYs). A retrospective cross-sectional study using a cohort of all funded primary research and evidence syntheses projects received by the HTA Programme from April 2011 to March 2016 (n = 363); to determine the proportion of spend by disease compared with burden of disease in the UK calculated using 2015 UK DALY data. The programme costing just under £44 million broadly reflected UK DALY burden by disease. Spend was lower than disease burden for cancer, cardiovascular and musculoskeletal diseases, which may reflect the importance of other funders, notably medical charities, which concentrate on these diseases. The HTA Programme spend, adjusted for other relevant funders, broadly matches disease burden in the UK; no diseases are being neglected. Comparing funding to the burden of disease, as measured by Disability-adjusted Life Years (DALYs), has been used to assess the appropriate spread of spending. DALYs take into account both the potential years of life lost due to premature death and equivalent years of healthy life lost by virtue of being in states of poor health or disability . Previous studies comparing United States (US) National Institutes of Health (NIH) funding to burden of disease have shown DALYs to be the single best correlate with spend by disease . Other studies have focussed on the association between randomised trial or systematic review evidence and global burden of disease [3–5]. The UK Clinical Research Collaboration (UKCRC) undertook an analysis of public funding of health relevant research in the UK in 2014 . The analysis included funding by 64 organisations such as the government, charities and UK Research Councils (RCUK), corresponding to over £2 billion of investment. Figure 1 summarises the UKCRC results, by descending DALYs. Of the four disease categories with the largest DALY burden, only public spend on the Cancer category is closely correlated with the burden of disease in the UK, and the majority of this support is provided by charities. Funding by the Department of Health (UK government) covered 29 departments, but most of the funding was for infrastructure, rather than research. The National Institute for Health Research (NIHR) Health Technology Assessment (HTA) Programme is included among the 29 Department of Health departments. The HTA Programme is the largest and longest-running NIHR research programme, it mainly funds research trials and systematic reviews of the clinical and cost-effectiveness, of health technologies. Criteria for HTA Programme funding are (1) the need for evidence and (2) scientific quality, reflecting funding of the NIHR by the NHS . The need criterion has two implications: coverage of the spectrum of diseases, but also taking account of research supported by other funders. The latter include the UK’s disease-specific medical charities, the biggest of which cover cancer, cardiovascular and musculoskeletal diseases. Consequently, one would expect HTA Programme spend to be well spread across diseases, but relatively lower in those diseases which have substantial charity funding. This paper compares HTA Programme spend with the UK burden of disease as an indicator of ‘need’. Age-standardised 2015 DALY data for the UK (all ages and both sexes) from the Institute for Health Metrics and Evaluation Global Health Data Exchange were used . These data for 316 specific diseases were assigned to the 21 Health Research Classification System (HRCS) health categories (which are derived from the World Health Organisation International Classifications of Diseases) independently by two of three coders (GB, LD and AB-J; data available in Additional file 1). Any disagreements were resolved in discussion with the third coder. The nature of the HRCS prevents dual coding. If a disease falls into two or more HRCS categories, the disease is apportioned equally between the two codes. For example, cellulitis is coded as 50% Infection and 50% Skin in HRCS. This coding gave a DALY estimate for each health category, allowing the percentage of the total burden of disease in the UK for each category to be calculated. All funded primary research and evidence syntheses projects received by the HTA Programme between 1 April 2011 to 31 March 2016 were included (n = 363; data available in Additional file 1). All funded applications received by the HTA Programme are routinely coded using the HRCS. If the disease described in an application falls into two different HRCS categories, the project is apportioned equally between the assigned codes. For example, a project concerning diabetic retinopathy would be coded as 50% Eye and 50% Metabolic and Endocrine. HTA Programme spend data were derived from the NIHR Evaluation, Trials and Studies Management Information System (NETS MIS) and mapped to DALY data using HRCS health categories. All analyses were in Excel 2013. Costs included research costs only. Three hundred and sixty-three projects were identified for analyses; 277 were randomised controlled trials (RCTs). Total spend was just under £400 million and RCT spend was £354 million (Table 1). HTA Programme total spend (by HRCS category) was compared with 2015 UK DALYs (Fig. 2). Total spend across the 21 health categories was fairly well correlated with their DALY burden, (simple linear regression; r2 = 0.61; 95% confidence interval (CI) 0.36–0.82). 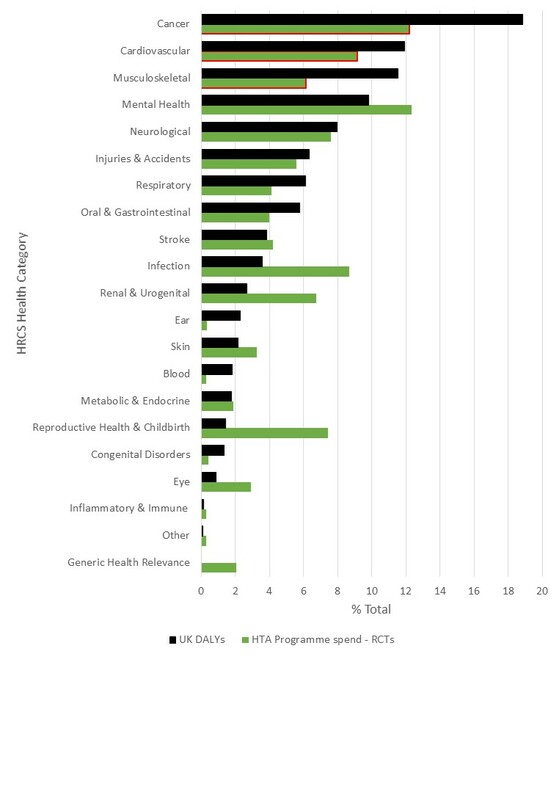 Spend by the HTA Programme was higher in Mental health, Infection, Reproductive health and Childbirth, Renal and Urogenital and Eye categories than their associated DALY percentage (Table 1). HTA Programme spend broadly supports DALY burden by disease in the UK; no diseases are being overlooked, either in terms of total spend or from the perspective of RCT spend (Additional file 2). Discrepancies between DALYs and spend by the HTA Programme are compatible, with the latter funding less research in diseases supported by the medical charities. The main strength of the study was the inclusion of 363 research projects over a 5-year period. This reduced the variation that could otherwise be caused by funding a few expensive projects in a short period of time, or the effects of NIHR research priority calls which could cause spikes in certain disease areas. A limitation of the study was the use of DALYs, which are crude measures of overall disease burden, and do not capture the wider effects of interventions such as Quality of Life, impact on carers and family, or non-health effects such as economic and social consequences (such as loss of work) [9, 10]. As expected, there was a lower proportion of HTA Programme spend for cancer, cardiovascular and musculoskeletal diseases. These three disease categories have funding by three large medial charities: Cancer Research UK, British Heart Foundation (BHF) and Arthritis Research UK. The largest medical charity, the Wellcome Trust, supports research across all diseases . There were a number of diseases where HTA Programme spend was greater than the burden of disease, including Infection, Reproductive health and Childbirth, Renal and Urogenital and Mental health categories. These research topics have been neglected historically. For example, national and global underinvestment in mental health and infectious diseases has been noted [11, 12]. The relationship between DALY data, allocation of research funding and improvements in health is likely to be complex because health problems are not all equally set for research advances . Diseases vary by the existence of interventions that might be usefully evaluated. Increased research funding for a disease may not automatically reduce the burden of disease. An analysis of NIH funding and its correlation with US health dynamics over 50 years found that increased funding for heart disease and stroke was associated with reduced burden of disease; but there were no clear associations for cancer and diabetes . In addition, spend may not be the most appropriate measure to compare with burden of disease because projects vary in cost, with trials costing much more than systematic reviews. DALY analysis is a useful screen to see if any disease areas are being neglected, and so is of value when looking at the spread of funding by individual funders. Our results suggest that there are no major concerns for the spread of HTA Programme spending. Other funders may find it useful to perform a similar DALY analysis. However, funding organisations should not align their spend directly against disease burden using DALYs, given that there may be a lack of worthwhile interventions to test in some diseases, and that research may already be well supported by other organisations. The authors would like to thank: Paul Biggins for developing the report to extract the funding data from the NETS MIS and for his support in ensuring robust data to underpin the project; Andrew Cook for his advice in the earlier development of the work. This research was supported by the NIHR Evaluation, Trials and Studies Coordinating Centre (NETSCC) through its Research on Research programme. The views and opinions expressed are those of the authors and do not necessarily reflect those of the Department of Health, or of NETSCC. FC updated the data analysis using 2015 GBD data and information about HTA Programme-funded research from 2011 to 2016. She drafted the final version of the manuscript. GB undertook the initial acquisition, analysis and interpretation of original data (2013 GBD data; HTA Programme spend 2010–2015). She wrote the first version of the manuscript (using original data) and reviewed the final version. ABJ interpreted original data with GB, edited the first version of the manuscript, critically reviewed data content in the first version of the manuscript and reviewed the final version of the manuscript. LD advised the team on methodology and commented on iterations of the manuscript. SP guided development of the report to generate the DALY vs HTA Programme spend analysis, verified the accuracy of the spend report data, advised the team on content of the first version of the manuscript and reviewed iterations of the manuscript. JR advised the team on methodology and edited the final version of the manuscript. All authors read and approved the final manuscript. FC is employed by the Wessex Institute and works for the Research on Research programme; she also worked for the HTA Programme between 2012 and 2015. GB is employed by the NIHR Evaluation, Trials and Studies Coordinating Centre (NETSCC), which hosts the HTA Programme, and is a research fellow in the Topic Identification Team. ABJ is employed by the Wessex Institute, leads the Research on Research programme and worked for the HTA Programme between 2008 and 2009. LD is employed by NETSCC and is a senior research fellow for the Efficacy and Mechanism Evaluation Programme. SP is employed by NETSCC and is the Assistant Director, Applications and Funding. JR is a professor of HTA at the Wessex Institute and is a member of the HTA Programme Editorial Board. WHO. Health statistics and information systems. Metrics: Disability-Adjusted Life Year (DALY). http://www.who.int/healthinfo/global_burden_disease/metrics_daly/en/. Accessed 1 Feb 2017. UK Clinical Research Collaboration 2015. UK Health Research Analysis 2014. http://www.hrcsonline.net/sites/default/files/UKCRCHealthResearchAnalysis2014%20WEB.pdf. Accessed 1 Feb 2017. Institute for Health Metrics and Evaluation. Global Health Data Exchange—GBD Results Tool. http://ghdx.healthdata.org/gbd-results-tool. Accessed 1 Feb 2017. MQ Landscape Analysis. http://b.3cdn.net/joinmq/1f731755e4183d5337_apm6b0gll.pdf. Accessed 1 Feb 2017. Priority-setting processes—Scientific opportunities and public needs. NCBI Bookshelf [Internet]. https://www.ncbi.nlm.nih.gov/books/NBK45366/. Accessed 1 Feb 2017.